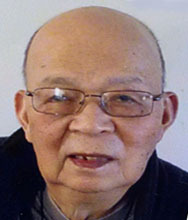 Chuck Sum Yee, 88, of Cranston passed peacefully Saturday, June 23, 2018 at Kent County Hospital. Born in Taishan, China, he came to the United States in 1987. He was the husband of Guang Yun Gu. Mr. Yee worked as a Mining Engineer for 35 years before retiring in China in 1987 and then again in 2004 in the United States. He had a Bachelor's Degree from China. He leaves a son Kevin Yee from San Jose, CA, two daughters; Jinzhu Yu of Cranston and Lulu Yu of Guangdong, China, and two granddaughters Jin Zeng from Guangdong, China and Yiwan Zhou of Cranston. He was the brother of the late Nancy Chin. Family and friends are invited to Mr. Yee's funeral on Thursday, June 28, 2018 starting with visitation at 8:30am to 9:50am and the funeral service will start at 10:00am. Burial will be at the Pawtuxet Memorial Park at 100 Harrison Avenue, Warwick, RI.